(Fallon) Today an auction of horses took place at the Fallon Livestock Auction grounds under extreme controversy. After hearings and a denial of a Temporary Restraining Order (TRO) added to an underlying Complaint existing for the Bureau of Land Management (BLM) Owyhee Complex, a TRO was granted to a new complaint filed by WHE attorney Gordon Cowan and attorneys representing AWHPC (a wild horse advocacy coalition). The restraining order required that no unbranded horses would be auctioned. 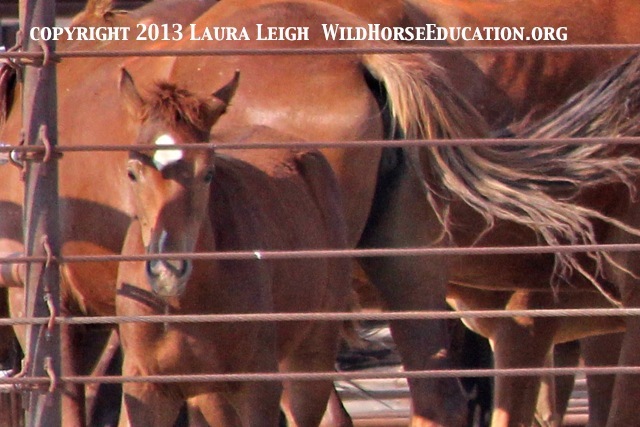 After considerable negotiations Laura Leigh (President of Wild Horse Education, WHE) and Deniz Bolbol and Suzanne Roy (representing American Wild Horse Preservation Campaign, AWHPC) were allowed to go through each pen after the livestock center “sorted” out branded and unbranded horses. The trio discovered nearly 60 other horses that were unbranded. The livestock center sorted those horses out. During the auction one horse came through unbranded and the auctioneer did stop bidding and sent the horse back to the pens containing the unbranded.